I try to sort my social media options into little life categories. More and more, social media can’t be compartmentalized. Just as learning can be messy, life expressed through social media isn’t always so concise. 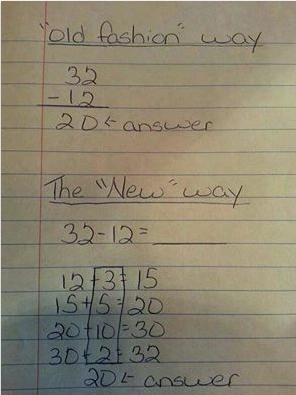 I kept seeing this hand-written math problem with the title “This is Common Core” floating around Facebook. I did so well keeping my mouth shut about it, until a friend invited my opinion. So, I posted the problem on my own wall and encouraged discussion and feedback. My take-away: Parents and teachers, if a child presented you with work that resembled the “new” way, what would your first reaction be? Would you first seek to understand the student’s method and thinking, or would you break out a red pen? I would hope the former. Feel free to continue the conversation here. Update: It appears I’m not the only math educator out there who couldn’t stay silent. Read more from Justin Aion and Christopher Danielson. This entry was posted in Algebra 1, Pre-Algebra and tagged CCSS. Bookmark the permalink. I too have seen this (and another similar one) show up on my Facebook page. I’ve commented a few times. It doesn’t really surprise me when people so vehemently rail against it though. If all you ever experienced was the traditional algorithmic method and then shown this with no explanation (especially when the sample problem is one that requires no carrying) then yep that is probably the reaction you would have. In all honesty, I had never seen this method before and dismissed it as a joke the first few times I have seen it. I’ve since come to like it. But I think the problem here is that people don’t understand that efficiency and understanding do not necessarily go hand in hand. And often people get hung up on the method rather than what is really important is whether kids can actually find the answer when subtracting two numbers.